I've been tagged, by LEON! 1) Go to the 4th folder in your computer where you store your pictures. I have really enjoyed this tag because when I followed the rules and got to the 4th folder and picked out the 4th picture it was a very special one. 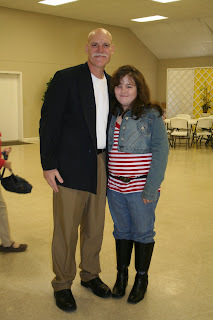 This picture was taken the day of my baby girl Anna Maire's Baptism. This is a picture of Bro. 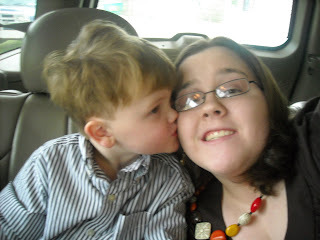 Webb Armstrong and Anna on January 28, 2007. A very special day in our lives. Bro. Webb and Louise will always have a very special place in the heart of my family. This picture brings back a lot of good memories for me. Thank you, LEON for the tag! Yesterday was a great family day! 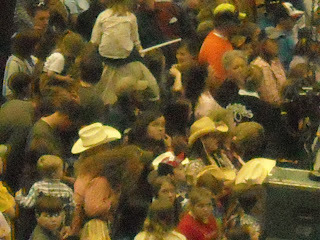 Everyone knows when the Dixie National Rodeo is going on you become a "Real" cowboy! 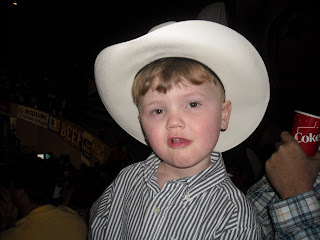 Yes, I said a "Real" cowboy....Noah William had been wanting to go to the RODEO all week, so I surprised him and his sister with tickets for Sundays 3:00 pm show. 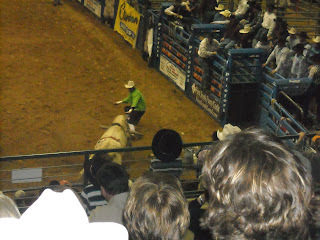 It was worth it all watching my baby boy be a "Real" cowboy. (Ha!Ha!) He had a ball. We played hookie from church to enjoy a family day. (I think the Lord would not have minded) I guess I should back up to Saturday. Noah wanted some new boots, boots like Thomas Patrick, you know green John Deer and nothing but! So we got up early Saturday morning to go to town to find some GREEN John Deer boots, and we did. He has not had them off sents we got them. We let the kids sleep late Sunday and then off the Jackson we went. We were going to eat a light lunch in Brookhaven and after the Rodeo we were going to eat supper. When we got to Brookhaven the lights were out and NO fast food, so on we went. We got as far as Byram and stop to eat a the Backyard Burger for lunch, which Noah loved because it had a inside play ground, but the GREEN John Deer boots had to come off to play. He made the sacrifice! After lunch it was on to the Rodeo! When we arrived I went straight to the box office to get our tickets, after talking to a machine I was a little scared of where we would be sitting. We had great seats! Noah's eye were big as coins the whole time. He watched everything that happen and will give you a play by play if you ask him! 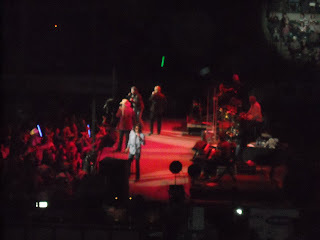 The Oak Ridge Boys were the entertainment! Old as the hills and still got it, or so Anna and Emily thinks. (Ha!Ha!) The girls got to be right up at the stage when they were performing. They thought that was really COOL! We all had a great time. I am really blessed to have a wonderful Godly husband and father, along with a beautiful young lady for a daughter and lets not forget about my "Real" Cowboy.